Bushnell 716185 Banner 6-18x50 Multi-X Reticle Riflescope 716185 FREE SHIPPING! This Bushnell Banner variable-power riflescope is optimized for low-light shooting, allowing more rapid target acquisition and engagement in the early morning and late evening. Its premium lenses feature an advanced and specialized Dawn & Dusk Brightness multi-coating that makes the most of the available ambient light to produce a bright, clear and detailed image. Its variable power and finely adjustable, resettable windage and elevation controls provide superior accuracy at any distance. Its rugged one-piece tube provides a high level of shock and impact resistance. The tube is also O-ring sealed and filled with nitrogen gas, making it completely waterproof and preventing it from fogging in cold conditions. 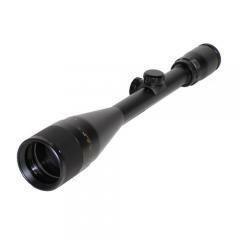 ©2002-2019 CopsPlus.com: Bushnell 716185 Banner 6-18x50 Multi-X Reticle Riflescope 716185 FREE SHIPPING!